[ Qoreader Blog ]: Into Meratus Mountain for Bamboo Rafting with Emily. After posted my reply, I left my phone number for her so that she could contact me later. And a few hours later, I got a reply from her. 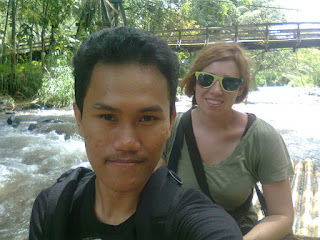 She was positive to go South Borneo and later she would contact me. 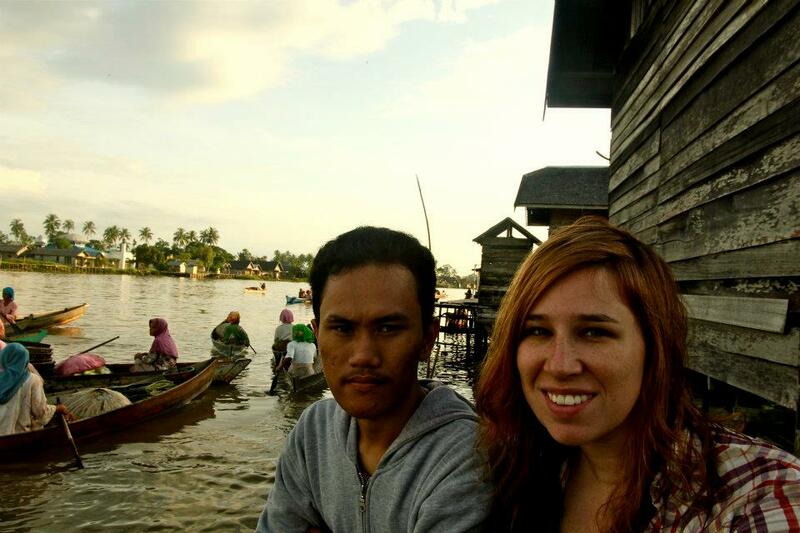 After a few days, there was a message from her that she has already in Banjarmasin city, I contacted her for having met up first. Because it was on the weekend, I got idea about asking her to join her trip in Meratus Mountain again. Finally, we had a met up in the city terminal first, her name is Emily, she is from America, and she is a Journalist. Three facts that I just knew when we meet each other. Before we left my city, I asked her to come to my home first, because I need to pack my clothes first beside I want to have a lunch and asked her to taste some Banjarese foods that made by mom. After arriving in my home, I introduced her with my family, because my parents already knew that I told them there was a foreigner would visit our home. As usual, my mom always over-excited if there were some foreigners in my home. In the afternoon and in the first time of her arriving, she told me to visit Meratus Mountain first because she just has three days of her vacation. Actually, I thought she could be in Banjarmasin in the first day for visiting some interesting places in my city first, but she said it could be late if she go in the second day. As I said, because it was weekend, I asked her to join her trip, and she agreed. She said she would be in Meratus Mountain in two days, and the rest she may be back in Banjarmasin and spending the day to go to some places. 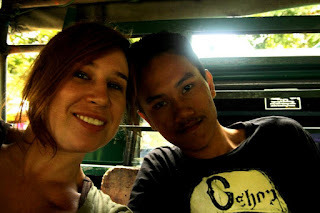 In the previous trip, I said to her that I ever hitchhiked a truck with another foreigners for getting in the Kandangan city. Because Meratus Mountain is located far away from Banjarmasin, it would take for more 4 hours if we use hitchhiked truck, but I thought it would save our trip-cost, and it would be fun for hitchikin because I personally prefer hitchhiking instead using public transportation. Actually, we could use public transportation, and it was more faster. 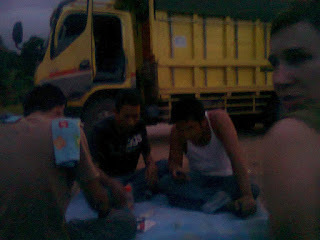 After having lunch, I asked my father to take us to Liang Anggang intersection, its about 10 kilometer from Banjarmasin city, because it’s easy to find any trucks to give us hitchhiking because the drivers wanted to go Amuntai and Barabai city, and their pathway is one direction to Kandangan city. On the way, i talked a lot thing with Emily, considering i am kind of difficult person for sleeping while in the car, i talked with her about her plan and other things. She told me a lot of her life story, in simple way, She is a journalist from America who works in Jakarta currently and she wanted to had vacation in South Borneo Island. Drop by with the truck drivers. The trip itself, it took more times, sometimes, i asked the driver to have a chat with me while Emily went sleepy. Its interesting to hear the story from the drivers, they always have interesting stories about their region where they come from. Sometimes, our truck dropped by in the middle of trip, at least we dropped by for 5 times, the reasons why our trip looked so long because the truck couldnt stand for it tires, after driving for 10 kilometer, the tires became hotter and would blow it if the truck didnt stop. In every stop overs or warung , the driver told us to have a dinner first before continuing our trip, because we were already full, we just ordered a couple of tea. Time by time, finally, we reached Kandangan city in 12.00 PM in the midnight, i said many thanks to the driver because he gave us his place with pleasure. In Kandangan bus terminal, i called a person who told us for giving his place to sleep tonight; His name is Nandang, he is native local people of Meratus Mountain, he is living in Kandangan city. He told me to contact his friends after arriving in Kandangan city. So, i contacted one of them by cellphone, not long time, they took us to their place; Mapala Hijau Base. In the place, i told Emily for take a rest, after had a little chat and watched a movie, i slept but Emily did'nt, she sang outside together with Mapala members, she said to me that she could play guitar, i still heard her voice while i was sleeping. Its beautiful. And then i fell down into deep sleep. In the morning, we had breakfast and prepared for going to Meratus Mountain to do bamboo rafting, it was sunday. So, i just have one day only, because tomorrow, i had a class that i cant leave. As we discussed first in my home, we were going to Meratus Mountain for Bamboo Rafting first, she said she want to stay in Meratus Mountain for two days, one day for Bamboo rafting, and the rest for staying one night at Dayak Balai Adat House and then trekking inside the jungle and want to see the Waterfall. 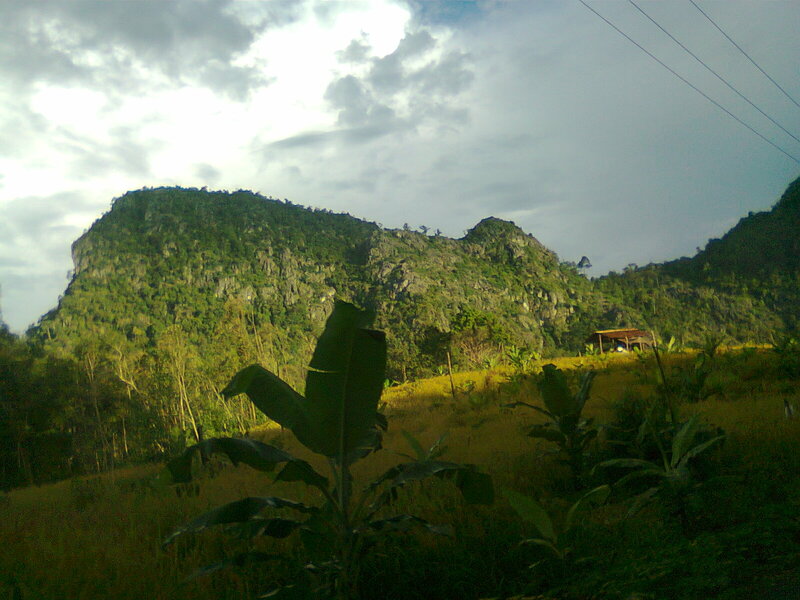 If you want to go Meratus Mountain, there are two ways to get it from Kandangan city. 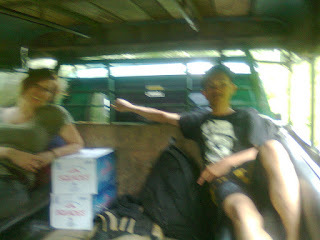 Using the village transportation car or using Ojek; Motorcycle transportation service. The car is more cheaper than using ojek, but only exist in the morning. It just cost Rp. 15000 only, and ojek is so expensive*for me; it cost Rp. 50000, during the trip, you would see some beautiful Mountain sceneries, and if you are lucky to find reckless an ojek driver, you would feel the experience in the near of the death*this is according my previous experience when i travelled previosly in going back to Kandangan city in the night, i got an reckless driver who drag their motorcylce like a pro racer. Anyway, the distance from Kandangan city to Meratus mountain is about more than 30 kilometer. It takes for more one hour if you use village car transportation. We departed from Kandangan in 09.00 AM, by using village car transportation we arrived in Meratus Mountain about 12.00 AM because we waited the car for another passengers. So, i think this is not recommended if you want to get fast trasnportation. Finally, we were in Meratus Mountain, the first thing first after we arrived, we looked for a bamboo-rafting jockey first, there were many jockeys that you can choose, the cost itself is relatively same. It cost Rp. 250.000 for three passengers, because we were two only, i said to Emily when we were in my home for cost-sharing, she just nodded with a smile. I thought it was like an agreement. 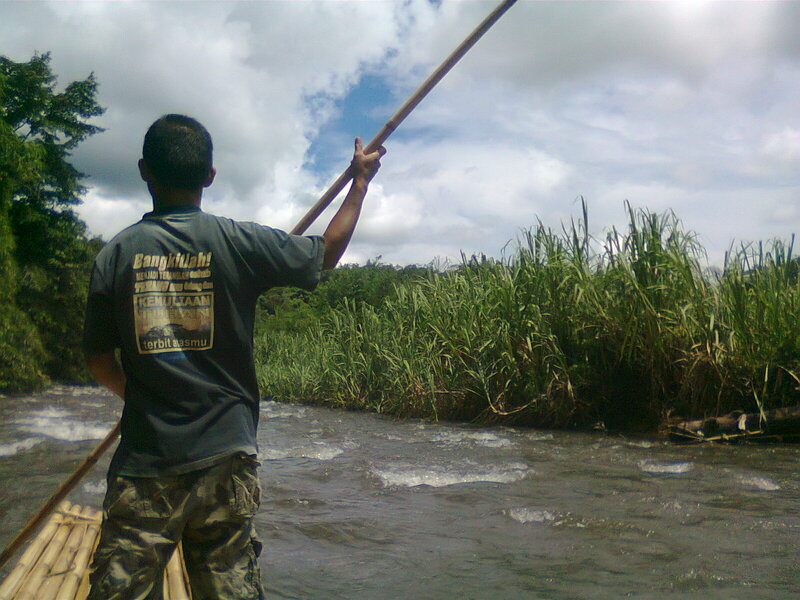 In the end, we hired a jockey for bamboo rafting. Before we going, we took a picture first. Narcistic way before we left. In the center of our river journey, we met some local villagers who did many things, our jockey also told us about many things in Dayak people history. I didnt remember his name, he told us, in the past. 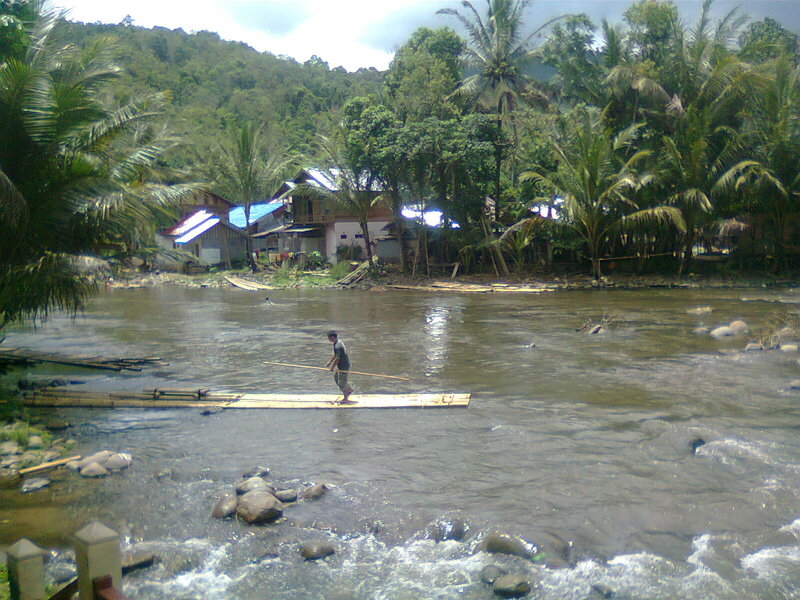 Dayak people use Bamboo for their transportation to go Kandangan city. Could you imagine it? All whole day, they were above the river and they crossed the rapids of Amandit River. And they came back to their village by walking only. What the! ?, if you know, at least the distance they must reached from Kandangan city to Meratus Mountain is more 30 kilometers. I can't stand for that one. After crossing the river for three hours, finally we arrived in the end of our rafting trip, it was raining and i almost got sick, but after drinking for a couple of teas and raw noodles, i got a little energy for continuing our plan to go Tanuhi Hot Spring, it was near from our place now. Just walk around 200 meter only, you can reach it easily. Our jockey offered us to take us to the place by his brother motorcycle, because after taking a bath in Tanuhi, Emily would taken by his brother to Balai Adat Place to sleep there in the night later. And luckily, we got free transportation and entry-pass, because according my friend who has already visited place, the entry pass cost Rp. 3000 only. And our jockey told us we didnt had to pay the entry pass. In the afternoon, after getting cold because the raining, we arrived at Tanuhi Hotspring, i never take a bath in the hotspring before, so after changin my clothes, i drowned my self in the hot water pool, OMG, i think its like normal pool, but it was wrong, in the first time, i screamed in my heart. Emily joined into the pool, there were crowded because there were many people in vacation and we got attention from another people,*actually not me, but Emily. She became like a celebrity, some people asked her to take a picture together. Me, just concentrating in meditation and thinking about this day. "Ok, Qori, you saved your money, so lets think about your come back to the Banjarmasin city tonight." That was my thought when i passed about money problem, because in that time, i dont have much money, but i enjoyed the trip actually. And then, i asked our jockey for calling an ojek for me to take me into Kandangan city first, because in Kandangan, there are many public transportation intercity that could take me back in my city just three hours only. In the end, i said to Emily if she done in Meratus City tomorrow, she could come back and stay in my home so that i would take her for meeting up with my friends and visiting some nice places in my city.